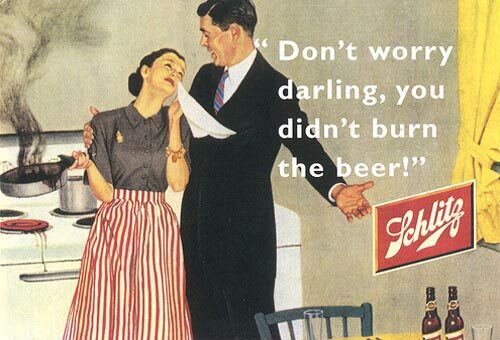 A classic advertisement from “The Beer That Made Milwaulkee Famous.” You make us all proud to be beer drinkers, Schlitz. I thought this ad was pretty funny in an “I can’t believe they printed this sort of thing” kind of way, and then I realized that I’ve burned beer before… and I felt shame. When you first start homebrewing, the issue of troubleshooting comes up right away. What do you do if you drop a spoon into your wort? Why isn’t my beer carbonated? Does it mean that I contaminated my beer if it smells like vomit after fermentation? Protip: yes. it does. Brewing is always a learning process: you often don’t realize how important something is until you screw it up. Don’t worry – you can usually recover from your mistakes and end up with drinkable beer. And then again, sometimes you end up with a contaminated mess that’s barely worth flushing down the toilet. Here are some basic things you can do to ensure quality in your own brews. First: Sanitation. You’ll see this everywhere you read about homebrewing, but you can’t be too careful with sanitation and cleanliness. Sanitation is something that most homebrewers take very seriously, and it can make or break a brew. Most people use a no-rinse cleaner, but you can also use a dilute solution of bleach. Don’t overdo it though: too much bleach will leave a chlorine-like flavor in your beer or worse kill your yeast. If you have bleach in your beer it can actually react with some of the flavor molecules, resulting in a solvent-like off flavor. Make sure to rinse several times with water after you sanitize with bleach, and never ever use a scented bleach. Second: Ingredients. Just like any other food, using fresh ingredients is key to making good beer. Expired yeast are often less viable, and can result in a longer induction period. Long induction periods can increase the risk of contamination of your wort, and give you a different, often worse, flavor profile. Using stale ingredients will also decrease quality. Older hops will lose some of the more volatile flavor molecules, and long-term storage can decrease the amount of bittering compounds present. Storing hops in your kitchen freezer is OK, but it’s still better to use them as soon as you get them. Third: Temperature. Paying attention to temperature at all stages of the brewing and fermentation processes is critical to making great beer. Boiling too long or doing an infusion at the wrong temperature (if you’re doing all grain brewing) can give you a different flavor profile. Same thing if you keep your fermenter in a place that doesn’t have a constant temperature or is in direct light – the yeast often do better when temperature is maintained, even if it’s slightly outside the recommended range. So those are a few simple things to consider when brewing, but you’ll quickly move on from there. As I’ve mentioned before, my go-to source for troubleshooting are Charlie Papazian’s The Complete Joy of Homebrewing and Dave Miller’s Homebrewing Guide. These books are great references, as we’ve noted before. However, there are lots of things they don’t cover and you may need to go elsewhere. Of course, there are tons of great websites that offer advice on homebrewing. So many, in fact, that it can be difficult to find a good one! Here are two that I like, and feel free to add any others that you know of in the comments section. NorthernBrewer’s Forums: This is a well moderated forum that’s filled with beer nerds looking to give and receive advice. A great place to go if you want to learn how to build a fermentation chiller, or even how to predict and calculate the final gravity of your beer. Aleheads love Northern Brewer, and with good reason: they “get it” – they do a lot to encourage people who love to brew, and it shows. So there are a few things to think about for troubleshooting your homebrew process. What are your experiences homebrewing? Any interesting problems come up that you couldn’t solve? Horror stories about sneezing into your wort right before pitching the yeast? I would like to point out that the Professor is dead on in pointing out that it’s hard to truly screw up homebrewing. I just finished a batch of Nut Brown Ale in which I used the wrong-sized carboy for primary fermentation (my brewing partner and I had accidentally switched them and he brought the wrong one to brewday). Then we broke our floating thermometer in the wort. Couldn’t have screwed it up more and I just cracked open a bottle after two weeks of conditioning and it’s absolutely perfect. Like Sam Smith’s without the butterscotch aftertaste. Marvelous. Something always goes wrong… Glad to hear the Nut Brown Ale is tasty. Enjoy that biacetyl!